Healthy tooth structure as nature provided is in fact the most durable and long lasting thing you can have in your mouth. Indeed any dentist needs some healthy structure to affect “any repair”. The maintenance you need is our top priority along with giving you the knowledge to “do-it-yourself” and so ever reduce your need for dental treatments. Enamel is the hardest structure in the body. It is as “hard as steel!” … Something most dental repair materials are not! It is made of a crystalline structure called hydroxyapatite. Once formed it cannot be replaced or healed by the body. This layer has no feeling, as it is a solid dead layer protecting the underlying “living” layers of the tooth. The dentine is a living layer similar to bone directly under the enamel. This layer receives nourishment from the underlying “pulp” via cells called odontoblasts. This allows dentine to maintain a certain elasticity that absorbs the shocks from bite forces and so prevents tooth fractures. The pulp is commonly known as the “tooth nerve”, supplies nutrients to the living dentine as an adult. Its main function, however is to “grow” the dentine and the root of the tooth during childhood. 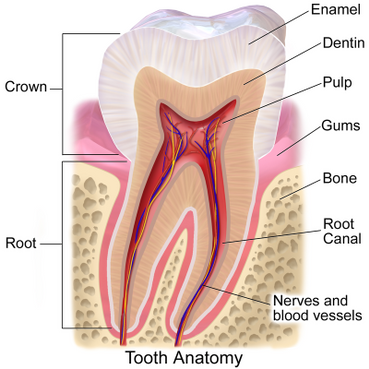 The pulp generally resides in a tube or canal in the centre of each root of a tooth. Depending on the tooth, the size and it’s need to withstand bite pressure a tooth can normally have up to four roots. The crown of a tooth is the part of the tooth visible above gum level. This is what you see in the mouth above gum level and is completely covered by tooth enamel. The root is the foundation of the tooth imbedded firmly in the jawbone. A strong root is required to withstand considerable chewing forces; so large molar teeth have several roots, whereas smaller front teeth have mainly only one root. There is a very thin layer of ligament between the bone and the root covering a large surface area acting as the main “shock absorber” for bite forces. This ligament is known as the periodontal ligament (gum disease affects this & so is in turn called “periodontal disease”).